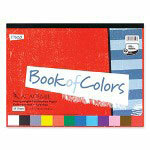 Academie Book Of Colors contains heavyweight, construction paper in assorted colors. Ideal for drawing and crafts. Acid-free paper is tapebound with a laminated cover. Colors include red, white, orange, yellow, blue, gray, pink, light blue, green, violet, brown and black.